Welcome to Married Life: SURPRISE! We went in for the mid-pregnancy ultrasound Friday morning and were hoping to find out the gender. Sadly, Brian had to stay out in the waiting room with our rowdy boys for the first 20 minutes so the tech could get measurements without distraction. She was chatting away, measuring the baby's head and I was finally feeling a little more connection to the reality of this baby. 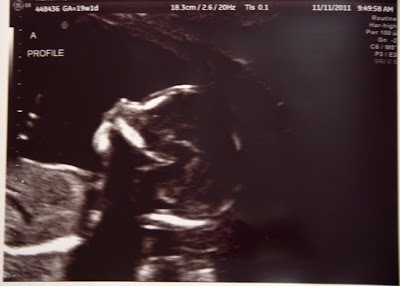 I've been so busy that other than the nausea and tiredness it's still a little futuristic that we're having another one! Then she started moving down the body and suddenly she moves sideways and goes, "Wait, did you midwife tell you you were having twins?" I was like, WHAT? She moved the wand back and forth to show me both babies and a few tears started leaking out. For sure, there are two babies in there! We found out that the the first baby was a girl and then the boys were coming in as the time for "measuring" should have been about done. She said that I could tell him and I said to Brian, "We have a surprise... there are two babies in there". Needless to say, he was a bit shocked (as am I) and then very very happy for about the next two hours! For those of you who might not know, he is a twin himself. After the second baby was measured up we found out that it was a girl as well. 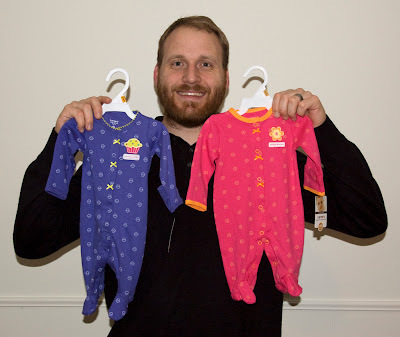 So... we wanted a girl and we got two! After stopping at the Verizon store and a very simple fix (take out the battery while the phone is still on to really reset it) we started calling everyone on our phone list! Good thing we had a 3 hour drive to Seattle to give us time to call (minus the dead spots). We needed to stop at the outlet mall to get the boys a few more winter clothes anyway so instead of picking out one new baby outfit I got to pick out two! This would also explain why I've been feeling kicks way up high as well as down low! I figured the high ones just had to be muscle twitches (which I also get a lot of) and the low ones were the baby. Now I know better! It's probably a good thing we were heading to visit my cousin in Seattle for the weekend so I could have some distraction rather than focusing on all the ways this is going to change things! I also think there's definitely something to those psychosomatic symptoms... since Friday I have felt absolutely huge when before I thought I was about normal! I have no idea what this means for my birthing center plans or even if the midwives will still see me, which makes me a little sad. But hopefully I will get a chance to talk to someone about this tomorrow! Congratulations! That is such fun news! Honey, I'm so excited for you. Twins! Wow, wow, wow, and girls even! hugs and kisses, and I'd pamper you if I could. Wow! Wow! Wow! Doubly exciting! Very cool and kind of scary. Its good you have your mom close! I still canNOT believe it!!! That's so awesome and exciting AND TWO GIRLS!?!? WAAA HOOO!!! =D That is just the most incredible thing. And definitely a surprise, yes! OMG!!! CONGRATULATIONS !!!!!! This post just made my day. Your joyous response to such big news is refreshing. Having twins is a dream of mine. Can't wait to follow your journey!! SUCH happy news!!! Many congratulations and warm wishes!! Sorry, that was me above! 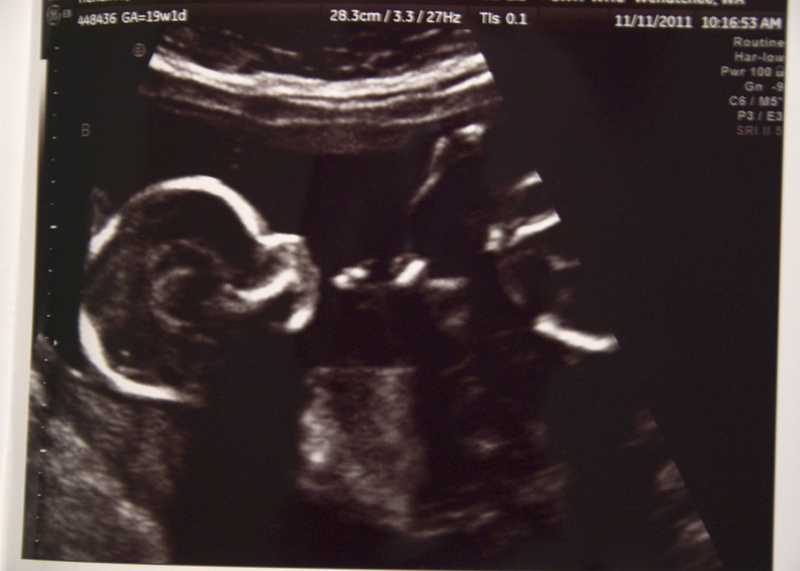 Looking at your 18 week picture, you do look small for twins, but it totally makes sense with how sick you are. I am so happy for you and your family! Congrats on the suprise! You will definately have your hands full now. Hey! Just got to read your story. Ours was somewhat similar. 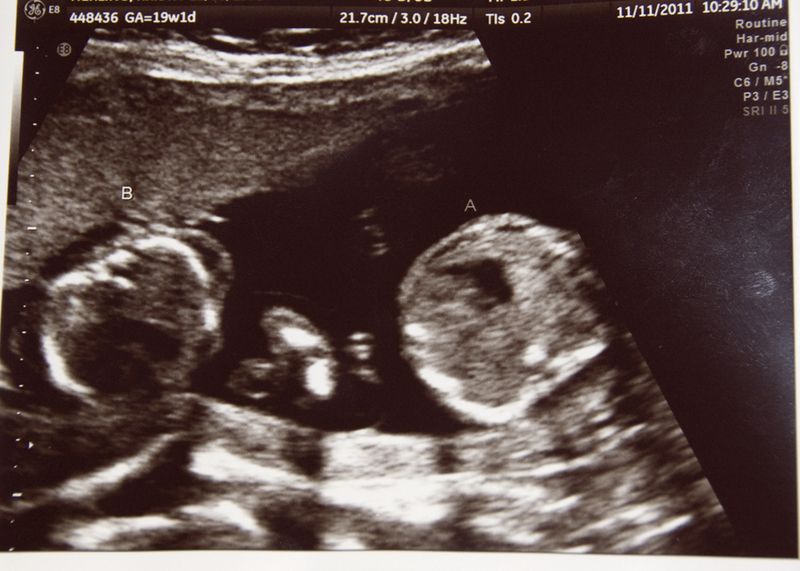 We even had an ultrasound at 7 weeks and there was just 1! So we didn't know till then, as well. One thing... I thought I would tell you as soon as we found out we were having twins, they immediately started talking c-section. I told them no, but they really insisted on having an epidural so that if they had to take them immediately they could. I had to be in a ER and everything (not the traditional rooms). I'm assuming yours are identical from your hubbies genes, which- at least what they told me- meant a birth in seattle. Not sure what a midwife will say but I thought I would warn you. When I found out birth plan changes it took me a good month of crying to get used to the change. I had to have a new dr, new birth plan, new everything, PLUS be ready for a crowd... 2 of every staffing position is required (nurse, OB, respiratory therapist) it can be overwhelming! Of course you already know that I'm THRILLED for you! Welcome to the community of twin mamas, friend. Twins are a TRIP and you're going to do great. KRISTA! See?!? This is what happens when I neglect my feed reader for a few days. SO HAPPY FOR YOU! Twin girls. God's blessings are so rich sometimes. What an exciting update! CONGRATULATIONS!